2K13 Feel Korea in Vancouver! Fans of KPOP in Vancouver! 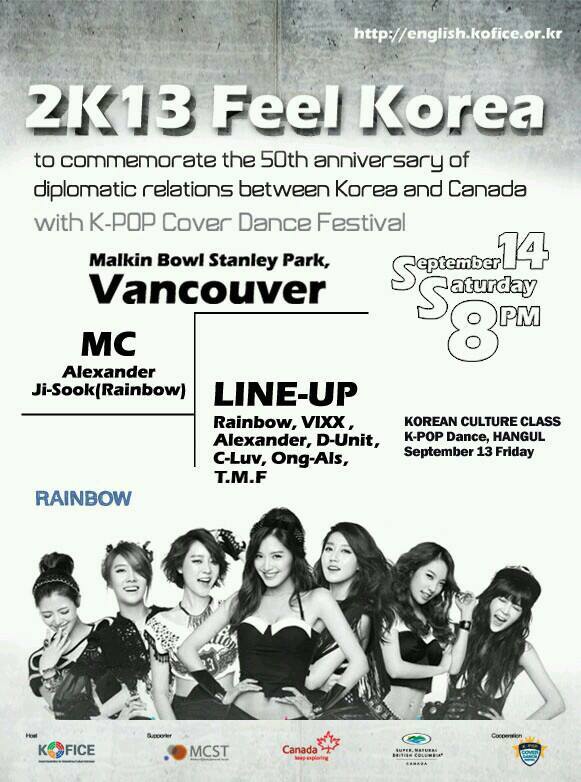 To commemorate the 50th anniversary of Korea-Canada diplomatic productions, KOFICE is teaming up with MCST to host 2k13 Feel Korea KPOP concert with the KPOP Cover Dance Festival. More information shall be revealed soon so like the FEEL KOREA page on Facebook for updates!!! Is this a paid event? if so, how do you purchase tickets. I see that the Malkin Bowl in Stanley Park doesn’t show this event occurring at their Venue. Has this been confirmed? Is this a hoax? There seems to be no information on this event. It’s not, I watched the show last night. I look and feel good to generally be here.. Keep sharing good things with buddies..